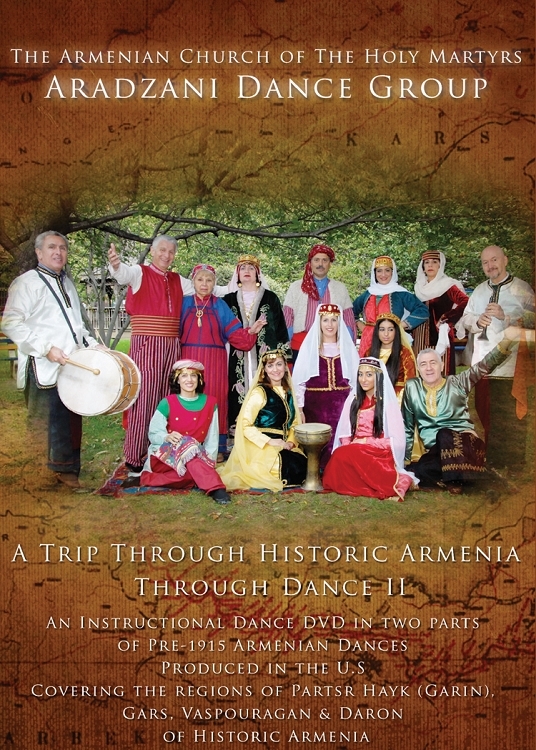 A Trip Through Historic Armenia Through Dance II is the second instructional dance DVD produced by the Aradzani Dance Group of the Armenian Church of the Holy Martyrs of Bayside, NY. The DVD presents dances from the regions of Partsr Hayk, Gars, Vaspouragan and Daron of pre-1915 historic Armenia. The DVD contains two hours of performance and two hours of instruction. It also includes video and slide footage of historic Armenia, an interview with Sason Demirjian, a native of Arkhund Village of Sasoon, along with video footage of the village. The DVD is a great tool for school teachers as well as anyone who would like to learn pre-1915 Armenian dances. Most of the dances presented are endangered.